We are proud to have been shortlisted in the International Project of the Year and Sustainability Award categories at the awards ceremony on July 5th, 2017 in London. 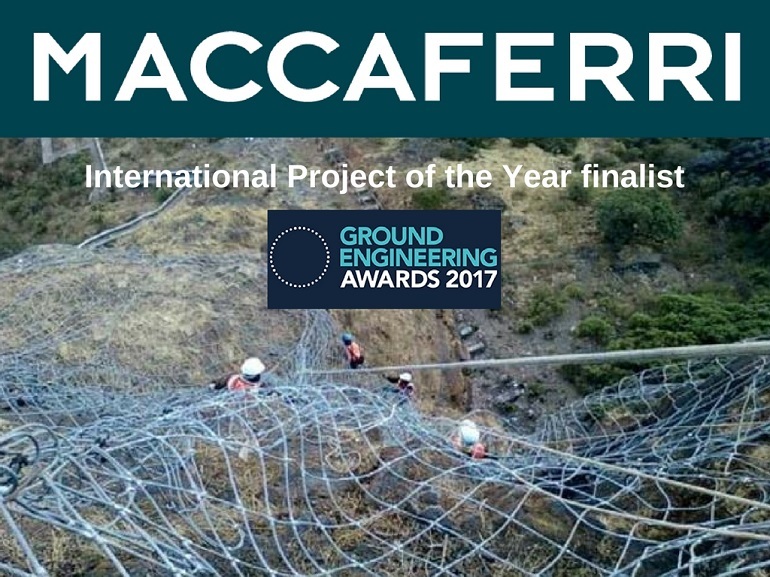 We are delighted to announce that Maccaferri has been shortlisted as a finalist for the 2017 Ground Engineering Awards, the flagship event for the geotechnical profession that celebrates the very best in the industry. Our challenging rockfall mitigation project at Saptshrungi Gad Temple has been shortlisted for International Project of the Year. The Saptashrungi gad is in the East-West range of Shyadri mountains, approximately 65 km from Nashik. With around 3,000 devotees paying their tribute to this holy place daily, the temple is one of the most visited religious sites for pilgrims coming from neighbouring states including Karnataka, Andhra Pradesh, and Gujarat. As the temple is situated high in the mountains, the Public Works Department of Maharashtra proposed a cable-car to take the devotees from the base of the mountain to the temple. However, the temple and the area of the proposed cable car station could be affected by rockfall from the cliffs above. It was therefore necessary to protect them from the risks of rockfall. Various protection measures were evaluated considering the challenging conditions of this site including its significant height (around 200m), angle of the slope, difficult access, surface instability and the short distance between the slope and the infrastructure. A dynamic rockfall barrier was installed to arrest rocks falling from the rock slope towards the cable car station. For further technical details, please download our Case History. Our environmentally friendly acoustic barrier protecting a residential area from the noise of the M40 Motorway in Banbury, UK, has also been shortlisted for the Sustainability Award. Made with Green Terramesh and unique ParaDrain geogrids, the structure is the result of an innovative design methodology and approach for reinforced slopes which re-uses the poor and marginal site won fill material as structural backfill within the acoustic bund.